Soaring through the waters at top speeds while clinging to an inflatable tube connected by a mere rope to a boat has become one of the top water sports for the summertime. Tubing is enjoyed by everyone from young kids to daredevil adults. This is true because you are able to easily adjust speeds and thrill to best suit the needs of the rider. The best tow tubes for advanced thrill seeking riders often look a bit different than a quality beginner tube. Everything from build quality and materials to the shape of the inflatable will affect how it rides and how much fun you will have on the water. As there are so many good tubes on the market we have created a list of our top picks. These towable tubes have a great combination of materials and features that will see you have the most fun no matter where you ride. The following is a list of the best towable tubes out there for both beginners and advanced riders. Ranging in price drastically, tubing is now a sport that just about anyone can enjoy. This is one of Sportsstuff’s best products of the year. The Big Mable Towable has been redesigned and includes an even more backrest and padded side walls. The cool thing with this inflatable is that you aren’t stuck with just sitting. You can ride in the prone position, kneeling, even backwards. Dual hook up points allow you to travel any way you want. All these features doesn’t mean you have to sacrifice build quality. The bladder is made with a heavy-duty PVC material that features welded seams ensuring it will last for years to come. Much like the other options on this list you will find EVA foam body pads that protect you from bumps and handles with knuckle-guards. All of this is backed up by Sportsstuff’s one year warranty. This is an excellent option for your next towable. 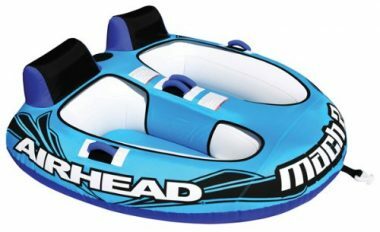 This 2 person towable tube is made using only top quality materials. Tested for durability, this tube was built to last. This is one of the top beginner tubes on today’s market as the cockpit sits riders securely in making it ideal for young riders. Sized for riders of all shapes and sizes, this can hold children or adults comfortably. Built for comfort this tube has inflated floors providing riders with a comfortable seat for prolonged rides. Four handles complete with knuckle guards are secured to the tube making it easy for riders to hold on as they soar through the waters. A heavy gauge PVC bladder ensures the durability of the tube while a durable drop stitched nylon cover holds strong showing the quality in the construction of this tube. This towable tubes for kids and adults is sure to make your summer a memorable one. Towable tube reviews are raving about the value in this pick. Built for up to four riders, this fun summer tube comes in at an incredibly affordable price. A heavy gauge PVC bladder combines with the heavy-duty nylon cover to create one durable tube. The reinforced towsystem provides a safe and fully reliable tube with enhanced performance. A speed safety valve helps this tube to inflate and deflate quickly with minimal effort. A hybrid system gives this tube an edge by reducing the drag thereby increasing speed and improving your boats fuel economy all while absorbing the shock from the ride. The tube comes with a self bailing drain vent which allows water to escape from the tube so you do not get further weighed down. This tube comes complete with an inflatable buoy that increases the rope height so that there is no drag. 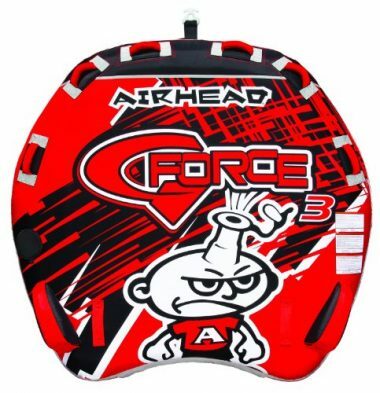 The AIRHEAD G-Force 3 is one of the top rated towable tubes on the market. This tube allows three riders to have the time of their lives on the water. Riders of all ages and skill levels will love soaring through the water on this tube. Six neoprene knuckle guard handles with nylon coverings provide a comfortable way for riders to hang on tight as they speed through the waters. Coming with a Boston valve this tube inflates and deflates quickly which combines with the Kwik-Connect feature for quick and easy attachment allowing you more time spent on the water. An 840-denier drop stitched nylon cover provides the quality you are looking for to safely ride in this tube. As a bonus, this towing tube comes with a limited one year warranty which allows you even more confidence that you got a fantastic tube. This is one of the best boat tubes you will find. You may have seen O’Brien’s name in more than just this list. That’s because they are one of the top water-sport manufacturers. Their products routinely get the top praise from even the pickiest of customers. 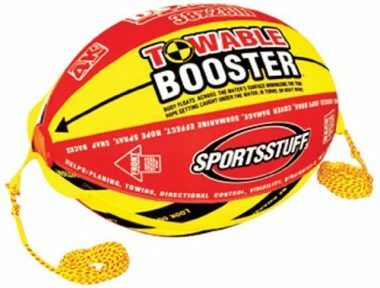 The Super Screamer Inflatable Tube fits this category as well. Made with only the highest quality material, 420-denier nylon and 26 gauge PVC, you won’t have to worry about this rig falling apart. Features like a Boston valve and easy to connect tow hooks make this a top contender for the best towable. If you like to move around while you’re on the water, the 6 handles and 2 EVA body pads will make that easy for you. Don’t worry if you fall off as there are easy to reach pull up straps to get back on. Airhead is one of those diverse companies. If it can be put on water, they make it. 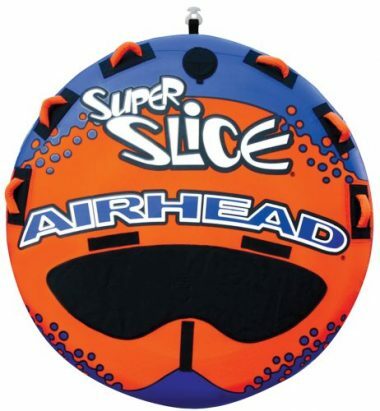 The Super Slice is a towable made from the highest quality materials and build practices. Instead of the regular 420-denier nylon AirHead upgraded to even stronger 840-denier nylon. This will give you twice the protection versus their competition. The 30 gauge PVC bladder has been wrapped with a nylon cover which makes the ultra durable insides nearly indestructible. An easy to use tow harness has been completely reinforced so that you can have maximum fun. The 6 handles ensure you stay planted on the towable and when coupled with the design shape all you need to do is sit back and hold on. Want to be the talk of the lake? The Airhead Hot Dog is the towable you want. Get your friends and enjoy a day or week on the water. A Kwik-Connect system will get you hooked up and ready to go in no time. Instead of a single chambered bladder, this includes a three chamber system utilizing 30 gauge vinyl. All of this is wrapped in top of the line 840-denier nylon. On top of this are the three seats which have pads to keep you comfortable. Each handle comes wrapped in soft nylon to make them easy and comfortable to grip. This is one of the largest towables on our list coming in at 103 inches long and 44 inches wide, deflated. Sportsstuff is at the top of their game this year. It’s no surprise that they have a few of the top towables of 2018. The Chariot Warbird 2 is another quality design and execution. It features high quality materials along with clever features. A lot of features come standard with Sportsstuff. One of these is a top of the line connection system – which makes it easy to strap to your boat. Also they are famous for their extra strong PVC bladders. This is something that you won’t necessarily see, but to know it’s there and working for you will give you peace of mind. Unlike other towables you won’t have to worry about getting scratched or dinged up. The Chariot has a soft cover for the zipper and extra padded hand grips. Comfort is this rigs goal. It features seats with high backs and loads of EVA padding that let you relax no matter how fast you’re going and a wide stance that makes corners more stable. If you are feeling particularly risky, you can even use the backward facing tow point. No matter if you’re going for an hour or a week you want to get on the water quickly and the quick inflation valves allow you to do just that. 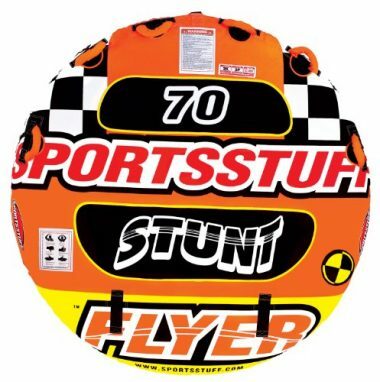 Your day on the water will be top notch with the Sportsstuff Stunt Flyer towable. It has a specially designed air valve that ensures not only the quickest inflation but also deflation. You won’t have to struggle to connect this to your boat as it has an easy to use aluminum connection. The EVA padding, and the covered zipper, will keep you from getting scratched as you’re being towed around and give you the most comfortable ride possible. Sportsstuff has thought of everything when it comes to the handles. They are double-webbed with a foam interior, but also include knuckle pads for the bumpiest of rides. This towable has a high quality build. Utilizing a double stitching method should keep you reassured that this will stand up to the elements and the test of time. The bladder is made using a heavy gauge PVC which has been said to be the best material for the job. On top of all of that the graphics will make you the talk of the lake. This is one of the best towables available today. 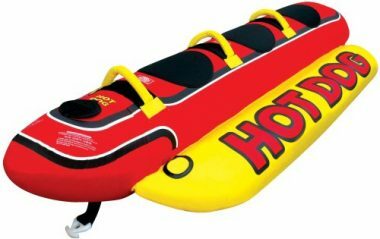 This Bingo inflatable is sure to produce the wow factor with your family as you can ride the tube in two different ways. Two riders can enjoy tubing in a seated position or twirl the tube around and hop on their knees for a more difficult ride. Both the front and back tow points on this tube are reinforced providing extra strength and ensuring your family sits in safety. A deep cockpit and high backrest allow riders to feel secure which makes this a great tube for younger kids who are beginners. Made using only high quality materials, this tube has a full nylon cover complete with zippers that are heavy duty and built to last. The foam handles have knuckle guards and are made of double webbed foam to ensure it is durable enough to withstand even the wildest rides. 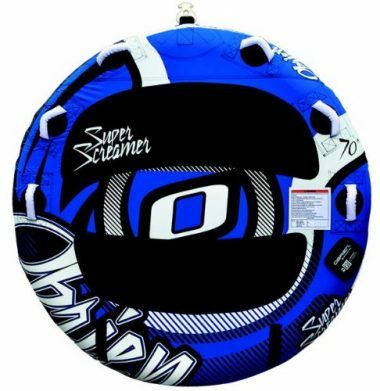 Advanced riders will enjoy that this tube features a drop speed bottom which allows it to glide atop the water causing less drag on the boat. This helps you to reach top speeds with your ride. This model comes in three different sizes allowing 2, 3 or 4 riders. 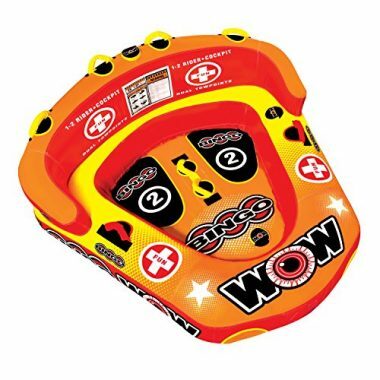 This ensures that no matter the size of your family, you can enjoy your summer with the WOW Bingo Inflatable. There are many features you should look for when purchasing a towable tube. Walking into a sporting goods store and buying the cheapest one could not only make for a bad time on the water, but can be dangerous. 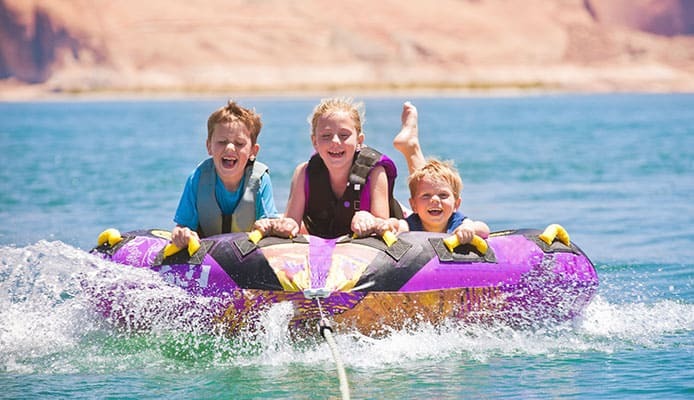 Investing a bit of money in the best towable tube to meet your family’s needs can save you money by not having to upgrade later. How many people can it tow? Tubes will come with a set amount of riders it can safely carry. This is going to be 1-2 or 3-4 people. 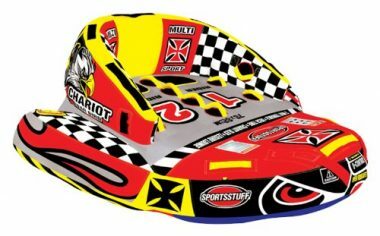 If you are buying this for your family it is important to think about how many people are going to be riding at a time. If your kids bring friends there may be a lineup for a turn on your floaty. Additionally, a 1-2 person towable will be smaller than the 3-4 person rig. This could make it easier to pack for an afternoon outing that only a couple people want to attend. Larger tubes can also be more dangerous. 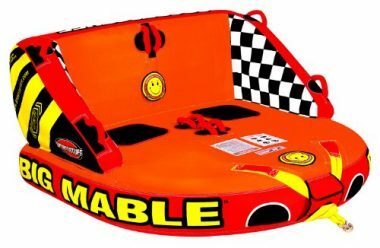 Since they are larger 3-4 person towable tubes can build up speed around corners and get air off the wake – something to keep in mind if you are the driver. This may be the most important aspect of your towable. If it hasn’t been built up to a high standard it could deteriorate on the water leaving your family injured. 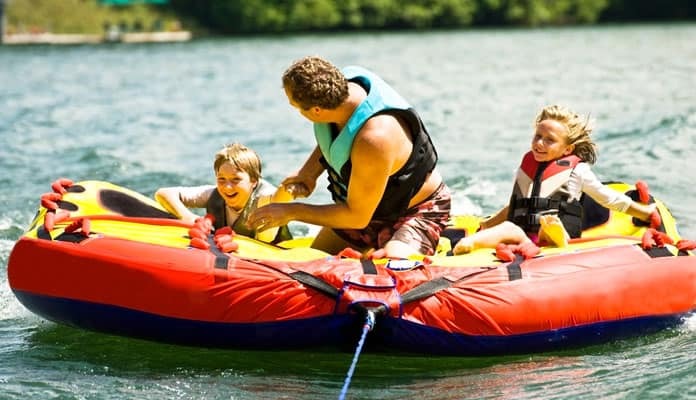 A tow tube that has proper construction will last years to come and have your whole family enjoying summer. The standard materials for towables are high quality nylon covering a high gauge bladder. A solid material for the covering is a 420-denier nylon material. This will keep your bladder protected while still feeling comfortable against your skin. 840-denier nylon is an even better material. It is literally twice the protection of the 420-denier nylon. The bladder will normally be a one chamber 26 gauge PVC chamber. Bladders can be up to 30 gauge and three chambers. These setups are generally reserved for the larger tubes so that the air can be dispersed over the whole towable tube. A single chambered bladder will usually have a quick inflate feature that will have you floating in no time. Since bladders are made of PVC they have the ability to have welded seams. One of the most overlooked aspects of inflatables is how much you actually inflate them to. Most don’t have PSI indicators to tell you how much air to add. Factors like hot or cold days will play a small role in how your tube’s air will hold up throughout the day. There is a few ways to tell if you have a properly inflated towable tube. If it is underinflated it won’t skim over the water. Instead it will be sluggish and take a lot of effort to pull which could also cause damage. Once the tube’s cover doesn’t have any wrinkles in it it should be good to go. Keep in mind that once you are on the water it is easier to take air out than to add it. This feature allows you to keep riding for hours without pain. Essentially this is a piece of padding on the inside of handles which protects your hands from bashing the side of the inflatable. Without these you could end up with bashed knuckles or scrapes on your hands. The standard floatable will come with EVA padding that keeps your ride comfortable. It can get bumpy on the water but having strategically placed padding will make you not even notice. Many companies have done tests to find out where most people’s elbows and knees rest when on the towable. They have added pads to these spots for your comfort and safety. Q: What Should I Do In Case Of An Accident? A: Accidents do happen, and there are steps you can take to ensure that you and your family are safe should the tube flip. The main thing you can do to ensure that everyone is safe is have every rider wear a lifejacket. If the tube does flip, then people will be able to float in the water until help can arrive. You should also make sure that everyone who is riding on a tube can swim so that they can get back to the shore if an accident does happen. If an accident does happen, then stay calm and help people out of the water. Q: What Should I Do As Driver? A: You are responsible for keeping your passengers safe when you are driving the boat. You are responsible for making sure that you have the correct size of tube and the correct number of riders for the tube. You should not exceed speeds over 20 mph, and you should make sure that you do not make any sharp turns or the riders can be thrown off. When you are stopping, you should dow down gently, or the tubes can hit into the back of the boat. You should also be aware of other boats and tubers in the water. Communicate with the people in the boat, and stay in contact with the people on the tube. Q: What Should I Do As Passenger? A: As a passenger, you are responsible for your safety on the tube. You should make sure that you are secure on the tube before the driver starts the boat. The other thing to decide on is some signals for communicating with the river and other people on the boat. When the boat gets up to speed, it can be hard to hear, so hand signals are better. You should also make sure that you are wearing your safety life jacket. As long as you are safe, you are going to have a lot of fun. Q: How Long Should The Rope Be? 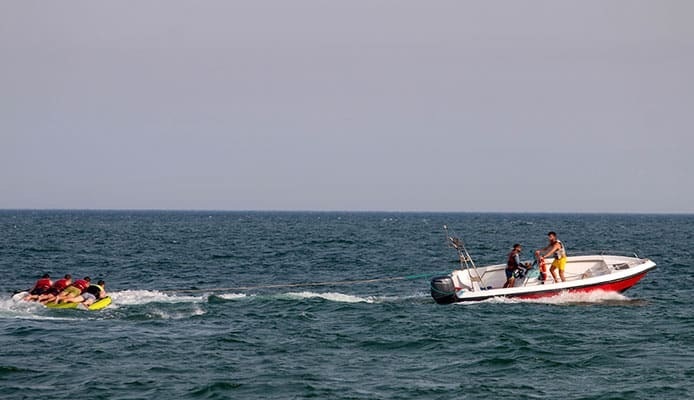 A: There is no towing without a rope from the boat to the tube. The first consideration is for the rope to be at least 20 feet long. This is to make sure that there is no chance of carbon monoxide poisoning. The ideal length of rope is between 50 and 65 feet. Q: How Can I Enjoy Maximum Performance With My Towable Tube? A: Some tubes will have a higher speed in the water than others. The less contact with the water, the easier a tube will be able to skim over the water. A convex shape is ideal. It will rise up in the water when it gets up to speed and skim across the water like a skimming stone. You should also make sure that the tube is inflated properly. If your tube does not have enough air in it, then it will drag in the water. The less resistance you have, the smoother and faster the ride will be. You should also make sure that you do not over-inflate the tube or you run the risk of the tube bursting as it skims against the water. Tubing has long been one of the most beloved water sports to do with your boat. It has come a long way since the typical black inner tube that was once used. From tubing on your knees, stomach or in the seated position there is more ways than ever to enjoy this sport. Some of the best tubes even go as far as having multiple riding positions and multiple people per ride. This makes it more of a social activity. The market is so saturated with towable tubes that it can get confusing. That is why we have compiled a list of the top towable tubes out there. Do you use one of the towable tubes from our list? Let us know how you like it in the comment section below.